“It is impossible not to fall in love with its deep and complex sonority”. Plectrum supports both USB and Bluetooth MIDI devices and works both as a standalone application, and as an Audio Unit plugin for GarageBand, Cubasis, AUM and other hosts. Whilst I can see this working very well as an AUv3, I’m not sure about it as a standalone app. In standalone mode I would personally prefer a more natural interface. 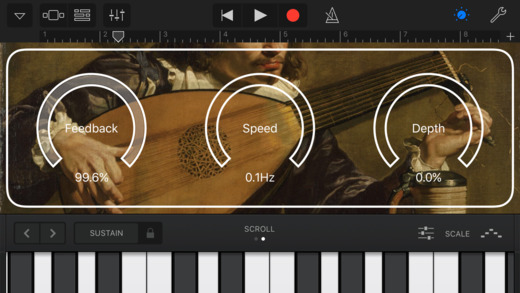 One that immediately comes to mind is the one for FingerFiddle, which is a great instrument app and has an interface the is more aligned to the sound it models, which I feel is important. So it could be a very useful app and probably a lot of fun too. But I’d like to see an interface that is consistent with the instrument. That would be nice. Having said that it’s a free app, so why am I complaining? I have to admit that I quite like apps like this.